Submitted by dennis on Friday, March 18, 2016 - 10:41am. 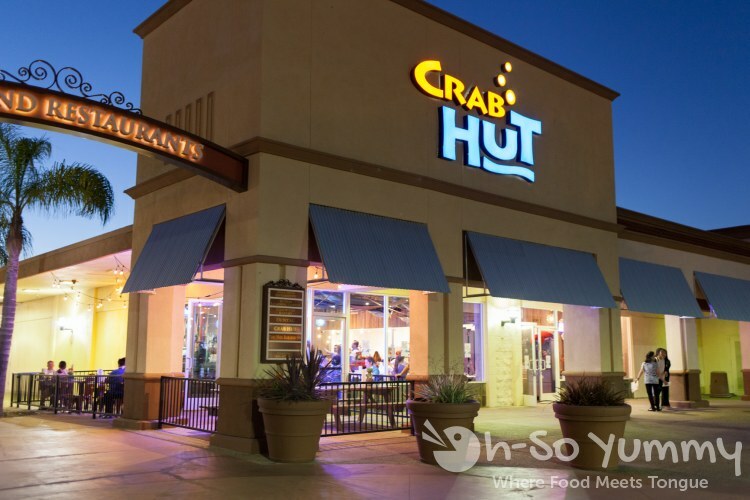 Crab Hut in Mira Mesa is finally open! My family has been waiting for this place to open for quite a while and they've been asking me to go with them since their soft opening a week ago. The place was packed when we went this past Wednesday. From what we've been told, it was much busier on the first day. There are not that many restaurants in the Mira Mesa area that have a full liquor bar. This place has plenty of seating and cheap $3 craft beer specials during happy hour (M-F 2-6). Oyster bar on the back half of the drink bar. There's even a person standing by to shuck oysters fresh right there for you! 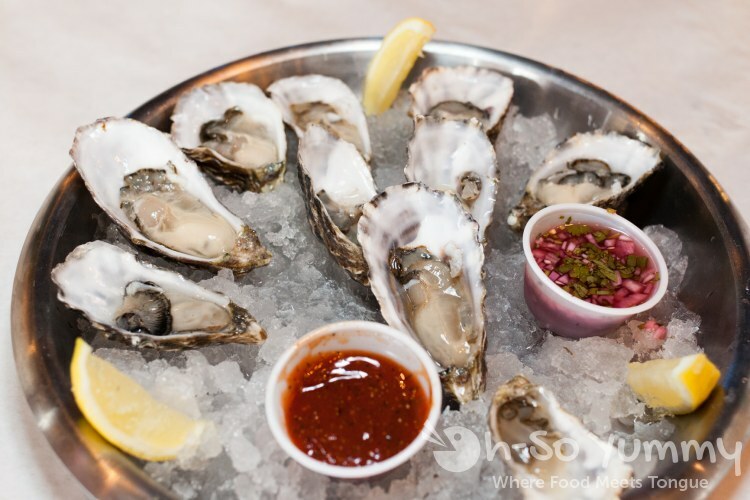 Select oysters are $1 each during happy hour and all day Tuesdays! They did a great job decorating this place. It's a large space and they filled it with interesting props and art. 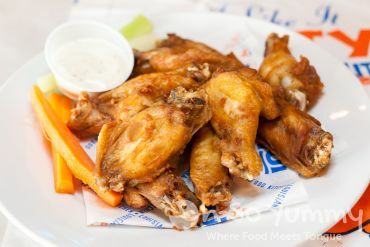 On Wednesdays there is a chicken wing special for fifty cents per wing. 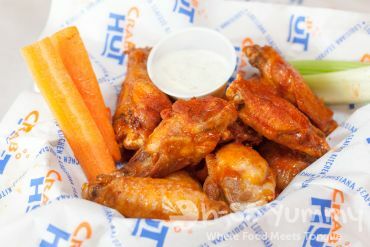 These light and crispy wings are not really that meaty but still a good size for an appetizer. The default wings come in a hot sauce. Unfortunately for me, I came to this restaurant with two people who did not enjoy spicy food and I had to get the regular wings. Our waitress was kind enough to bring a side of the sauce for me to dip it in. In the end, I preferred the wings without the hot sauce. But one thing you can do is dip the wings into the lemon and salt and pepper mix for a different kind of flavor. 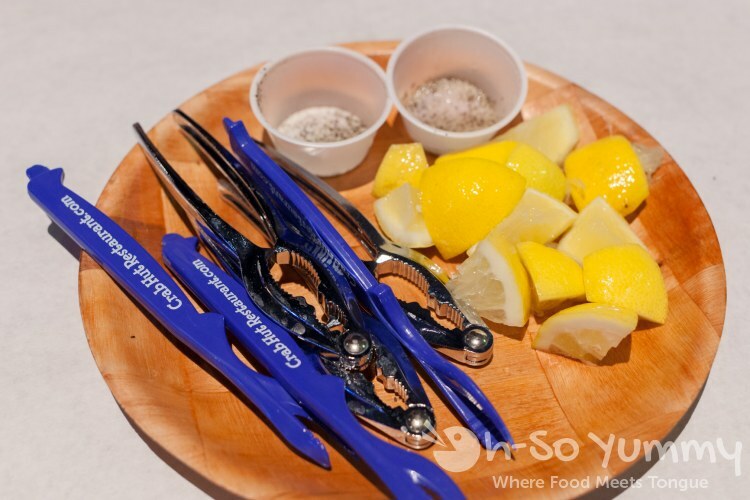 Your typical seafood weapons of war. The shell breaker and meat pick. They also give you a bib and latex gloves if you don't want to get messy. Don't know what to order? 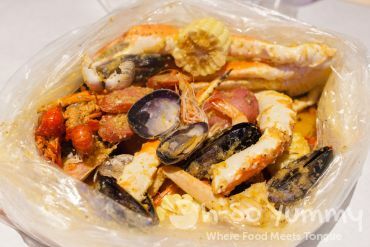 Get the Seafood Bucket! 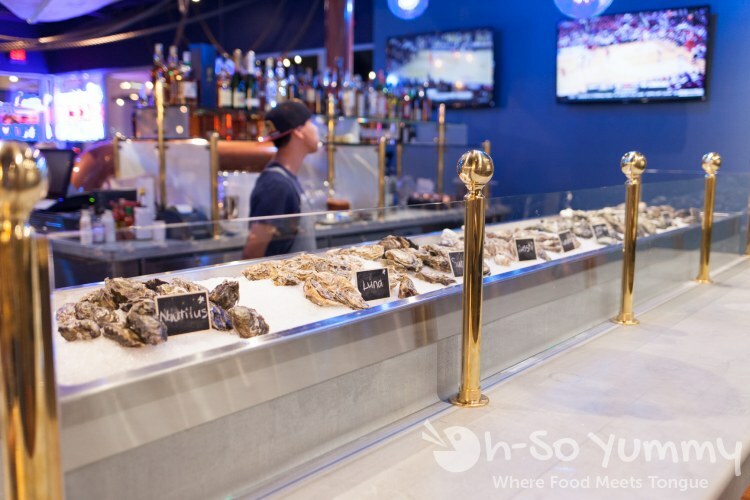 An incredible variety of seafood that feeds two to three people and makes for a great sampler. I recommend getting a bowl of rice so that you can take advantage of the sauce at the bottom of the bag. 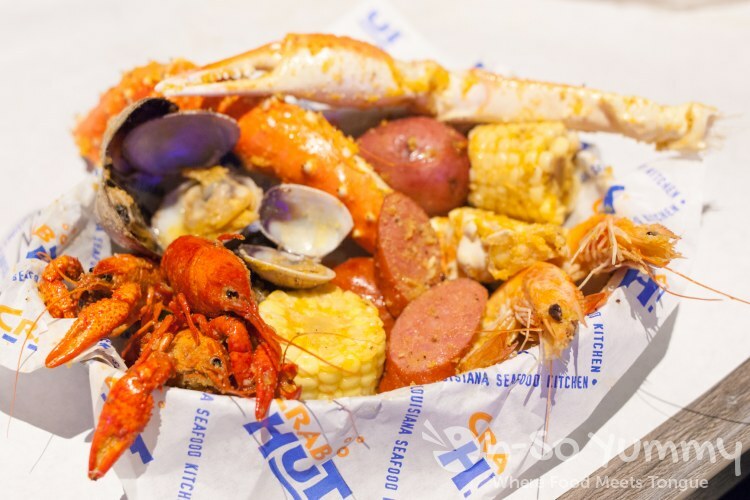 This entree includes "King Crab Leg, Snow Crab Cluster, Shrimp, Crawfish, Mussels, Clams, Potatoes, Corn on the Cob and Sausages mixed in Crab Hut's addictive Full House Sauce." 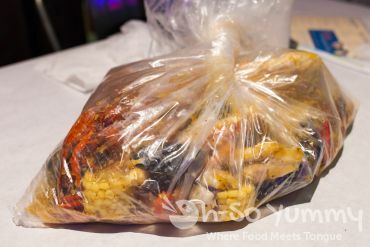 The bag doesn't look that big but once you start going at it for a while you'll realize just how much there really is. All items were pretty good. The only downside of course is that it is all flavored the same since it is all cooked together. The broth started out just right but slowly my mouth began to feel the spices. The King Crab legs were huge and simple to eat. Usually I'd break the shell and eat a section at a time but the meat on these stayed intact while sliding out of the shells. Maybe I was just lucky. The Snow Crab legs are something I'm usually more accustomed to so nothing out of the extraordinary for me. I can't recall the last time I had crawfish but it's just like how I remember - too much trouble for so little meat! It tasted great but I'll probably have to pass next time. The shrimp were decently sized too though you have to break the shell yourself. Mussels were tasty but not enough in quantity. This is a sampler so I can't really complain. For some reason I don't recall eating any clams. I'm sure Lynn and my mom grabbed them all before I could get to them! Even though it's just a side, the corn was surprisingly yummy. Unfortunately the potato was the least interesting since the sauce didn't penetrate past the skin. You have to break it apart and mash it into the sauce. The sausages were nice and give the meal some contrast. It's always great when new restaurants open up in Mira Mesa, especially since we won't have to venture far for good eats. We've only sampled two items from the menu but there's more we need to try. 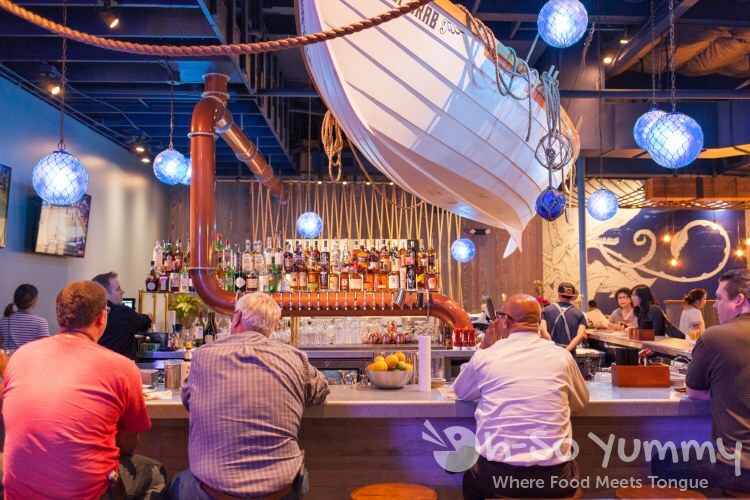 With an excellent happy hour and daily specials, we might find ourselves here quite often. Or at least, I might sneak in after work for some grub before Lynn gets home! $6 cocktails and $3 draft beers. The prices can't be beat and there's a decent selection on tap! $1 oysters seem fresh enough but aren't too big. Plenty of brininess to them. 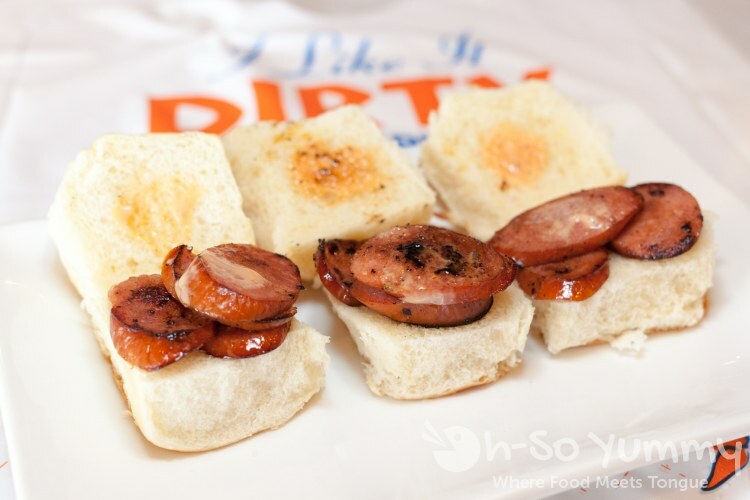 $4 Sausage Sliders taste fine but are a bit underwhelming. 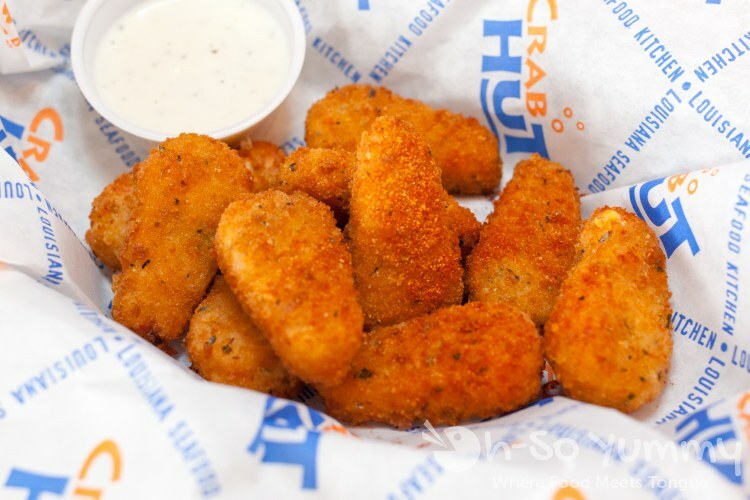 $3 Crab Poppers are piping hot when they come out, light fried breading with a creamy filling. Seemed to have a hint of heat in them. More 50 cent wings! Reminds Lynn of Wings N Things. Great post. Everything looks good here! This is the kind of place where you need to wear your thrasher clothes, ha ha. Even with those plastic bibs, I still make a mess. I wish there was a place like this down in CV. There used to be a place called Craw Island down here but it closed several years ago. my bib stayed pretty clean but the table gets messy with all the shells and juices from the bag! i'm not a fan of boiled shrimp because it's tougher but i liked that there were crab claws in this combo bucket! I haven't tried enough of the menu yet. I'd give it 7 for now. Enjoyed the combo mix but the wings were ok to me. Dennis really liked them though. 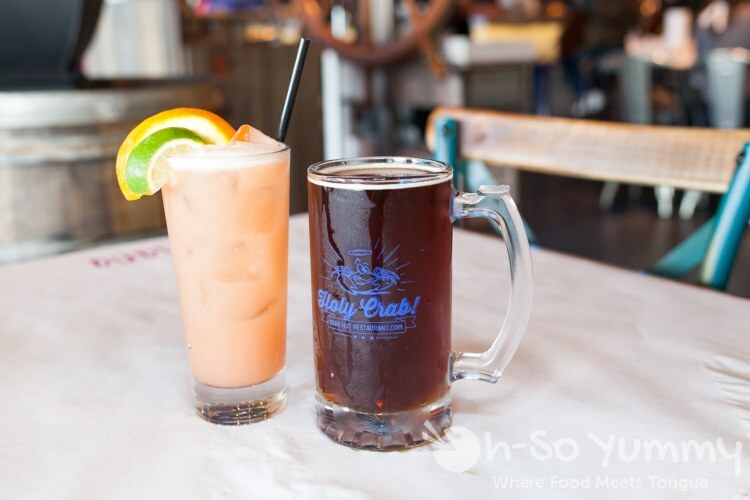 If you don't mind getting your hands a little dirty, we can try some of the non-spicy foods and have a happy hour beer. 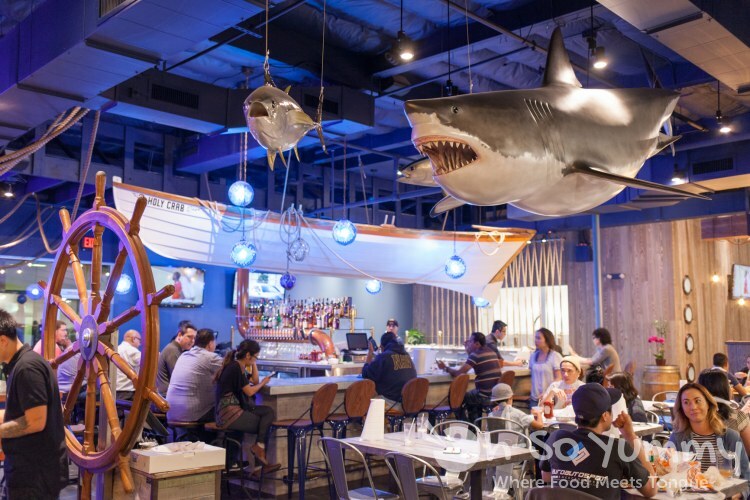 Love the decor of this place! I've seen a couple of crab huts throughout San Diego, but for some reason just always end up going to Boiling Crab when it comes to these seafood places, probably just out of routine. Think it's time to try somewhere new! i think i may have gone to boiling crab once, even though it's also in mira mesa. i wonder if this is gonna be serious competition between the two! I'm such a huge fan of this place - we go to the one downtown before Padres games! Love the look of the new location. i haven't eaten in a place like this for years! i think it's because boiled shrimp sounds kinda blah but this combo meal turned out better than i expected! Those wings looked kinda sad... Too bad you can't get them salt and pepper style. they are pretty small, even if they are only 0.50 each. i remember telling a friend that they reminded me of wings n things due to size. 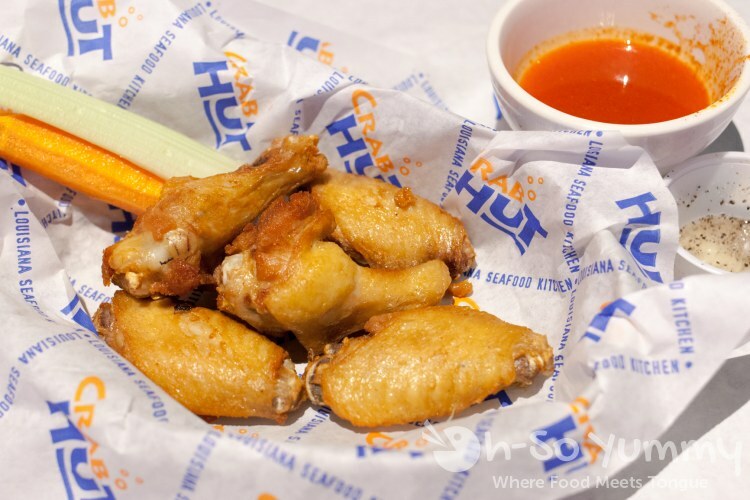 owner said this non-sauced version was a secret item on the menu... naked wings with a dash of cajon seasoning, available at any crab hut! Hey Lynn - Yep, the naked wings are the way to go. Looks like a really nice space. 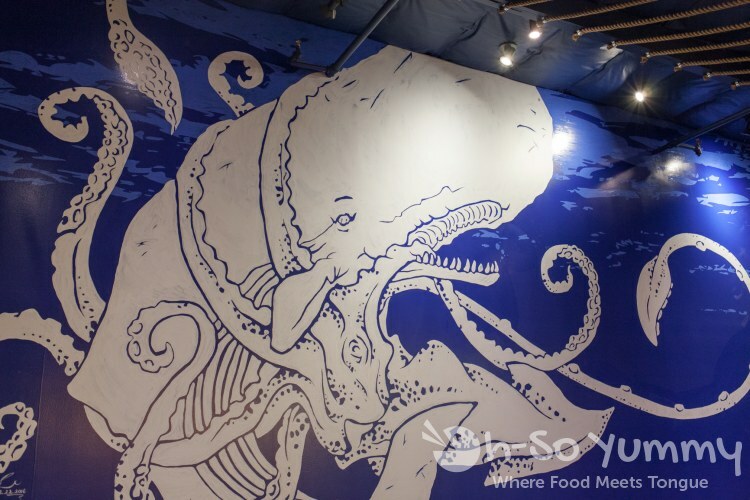 Hooray, another seafood place in Mira Mesa! I don't like the other crabby place over by McDonald's so I'm hoping this one is better. I'll have to find a seafood friend to go with me and check it out. I love the decor - it looks rad! you should totally ask about flavoring on your visit and give us the deets! i haven't hit a long line yet but we try to go before the typical dinner rush!